So already there are an extra two positions over the Bowflex selectTech 3.1 bench. Having six positions allows for dozens of different exercises and ultimate workout versatility. The great thing about the 5.1 is that the seat can also adjust to two different positions when working the incline – something that the 3.1 didn’t have which frustrated a number of users because they were slipping down when doing incline. This will let you get a better position so that you can have a stable base when doing dumbbell presses and not worry about loosing your grip on the seat. Being able to adjust the seat means you can get into the best possible position at all times during your workout, ensuring maximum comfort and support. If you’re better supported, you’ll have a more efficient and effective workout. The bench has a weight capacity of 400 lbs which is enough for most lifters. You can check this out more on amazon for a great price and ready customer reviews. You can pick up the 5.1 Bench for a great deal Here.. The Bowflex 5.1 is the same size as the 3.1, measuring 56” by 26” by 20” so it will take up a bit of space in your gym. It also weighs more at 66lbs so if it weren’t for the built-in wheels you’d find it a bit of a struggle to lug around and move in and out of place. The positive side this bench is sturdy and can handle people lifting big weight! This bench frame is made to last being constructed out of commercial quality steel so you know it’s a heavy-duty bench. Bowflex is know for making top notch bowflex home gyms so it’s to their benefit that they continue to produce quality benches as well to protect their reputation. The upholstery is durable and is easy to wipe down and clean after each use. While it shouldn’t rip or tear easily, the padding can wrinkle after a few uses which can make the bench look older than what it really is. The 5.1 also has a removable leg attachment if you need the added support for the decline position. Some users actually prefer not to have the brace attached, as they don’t like the feel of it against them while working out, with some saying it’s uncomfortable or even a distraction. Fortunately it’s removable so you have the option of whether you want it attached or not. It easily pops out with a pin in seconds so there’s no hassle if you need to remove it. As I mentioned earlier, there are also the obligatory wheels attached to make it as easy as possible to move in and out of place or roll away into storage. What is The Warranty For It? It comes with a generous 30-year warranty on the frame, and a one-year warranty for the upholstery. The bench will need assembling but it will come with all the nuts and bolts you need. Once assembled, adjusting the different positions is also easy and straight forward. I would plan to spend 30-45 minutes to get it all put together. There’s an annoying gap between the seat and backrest when in the flat position which is larger than most people would like. The seat itself is quite long –possibly too long for some people. People ended up rolling up a towel when the bench was flat to put in the gap. The wheels aren’t the greatest quality or seem to be in the best positioning. They’ve been known to lock up and therefore it makes maneuvering the bench in and out of place rather difficult. The bench is quite heavy and a bit bulky so you want wheels that can make transport easier. You might need to lift the bench up a little higher in order to get it sitting properly on its wheels when moving. This is a very sturdy bench that does not wobble but it’s long so short people will have a problem with this bench. I would give this a 4 out of 5 stars considering the gap between in the bench. 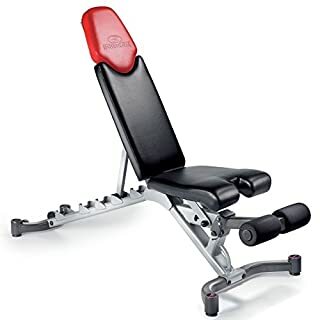 I would definitely pick this one over the 3.1 version as it has more angle positions, it’s heavier and has a bigger decline angle for sit ups. If you are still not sure about it then I would check out our detailed adjustable bench review here for more adjustable benches to choose from. Despite a few minor design issues, the Bowflex 5.1 is still a sturdy and reliable bench. It’s built to last, it has plenty of workout options and is ideal if you decline work and lots of different incline presses. It’s a very reasonable priced for such a trusted and reliable brand, and a bench which will last for years to come while keeping you challenged along the way. You can find out the best price right here and read more reviews.